Boom microphone can fold up and out of your way when not in use. Unidirectional microphone for clear voice capture. Easy to set up: No complex wires to your console. Requires sign in to Xbox LIVE to receive the latest console update. Microsoft Xbox One Stereo Black Headband Headsets for Microsoft Xbox One. Never used. Comes with headset adapter. Dispatched with Royal Mail 2nd class. Microsoft Xbox One Official Wired Stereo Headset. 1 x Xbox One Official Wired Stereo Headset. Boom microphone can fold up and out of your way when not in use. Unidirectional microphone for clear voice capture. 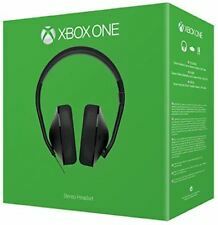 Microsoft Xbox One Stereo Black Headband Headsets for Microsoft Xbox One. Condition is brand new in box...never opened. Dispatched with Royal Mail Signed For® 2nd Class. Hear friends and foes in crystal-clear digital wideband audio. The Chat Headset is designed for comfort during long gaming sessions. 1 x Headset. Make the most of Xbox One gaming and communicate with ease with the MicrosoftXbox One Stereo Headset. Type: Xbox One headsets. Colour: Black. Full range audio spectrum. The headset can also be used with your PC, tablet or any phone so you can add quality audio to whatever you're watching. Hear friends and foes in crystal-clear digital wideband audio. The Chat Headset is designed for comfort during long gaming sessions. The headset uses wideband digital audio for crystal clear voice chat. Included in box is a micro usb cable. Full range audio spectrum (20Hz-20kHz) for deep bass, all the way to crystal-clear high frequencies. Unidirectional microphone for clear voice capture. Over-the-ear speakers for a comfortable fit during long gaming sessions. Multi-Format Stereo Gaming Headset for;. Flexible, mic-mute removable microphone. 40mm speaker drivers. Microsoft Xbox One Stereo Black Headband Headsets for Microsoft Xbox One. Condition is New without box. Dispatched with Royal Mail 1st Class. New gold jack fitted & tested to restore full working order. New jack is higher quality than original. Has original ear pads with green inside Some marks to be expected with glossy black parts of headset but overall good. Box is a bit tatty & faded in places some sticker slight tear. No adapter included so you will either require one of the new controllers which have a headphone socket or provide an adaptor yourself. Please view all pics before purchase to avoid disappointment. Stay in touch with your teammates using this single-ear headset from Microsoft. And this headset has an adjustable mic built-in, ensuring that you have everything you need to chat online. Compatible with all models of Xbox One. 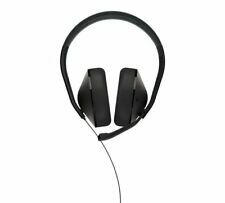 Microsoft Xbox One Stereo Black Headband Headsets for Microsoft Xbox One Pc Ps4. Condition is Used. Dispatched with Royal Mail 1st Class. Add rich audio to your gaming arsenal with the Xbox One Stereo Headset. The mic ensures clear voice capture even in the heat of battle. Xbox One Stereo Headset. It may have small scratches. Xbox One Stereo Headset. Genuine Microsoft XBOX ONE Stereo headset. NO COPY ! GENUINE / ORIGINAL ! Used but in very good condition, see original photos for preview. Fully tested and 100% working. Product does not include: USB cable, adapter jack 2,5mm to 3,5mm and original box. Going green, and recycling is a necessity of the future. Condition: This lot of headsets have been tested and are fully functional. Platform Microsoft Xbox One. Model Xbox One S. Earpiece Design Ear-Cup (Over the Ear). 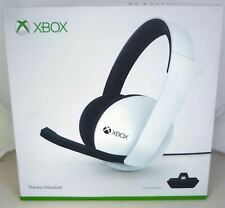 Xbox One - official Stereo Headset #white (used). official Stereo Headset #white. used official Stereo Headset #white | IMPORTANT: Tested & fully functional - Normal age-related traces of use. Pattern picture! This is a Used Microsoft Xbox One Stereo Over the Ear Headphones Wired Headset Black. Please refer to the pictures. This unit has been thoroughly inspected and tested by our in-house, factory-trained technicians. As a result of the technicians' professional handling and care, the unit has been returned to factory specifications. You can expect a fully-functional unit. . Platform Microsoft Xbox One. Connectivity Wired. Model Xbox One S. Features Microphone Mute Button. Earpiece Double. Color Black. UPC 885370817676. Connector(s) 2.5mm Jack. Official Microsoft Xbox One Stereo. Headset Only (No Adapter). The headset is faulty! The microphone does not work. Boom microphone can fold up and out of your way when not in use. Unidirectional microphone for clear voice capture. Easy to set up: No complex wires to your console. 6x Faulty 'Black' Official Microsoft Xbox One Stereo Headset Only (Faulty Microphone). 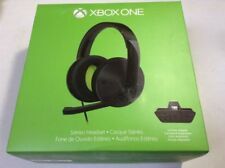 AS PICTURED - JOB LOT OF 6x 'Faulty' OFFICIAL XBOX ONE STEREO HEADSETS 'BOXED'. 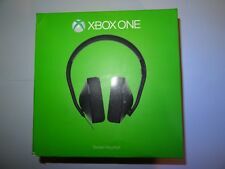 Official Microsoft Xbox One Stereo Black Headband Headsets (No sound ). Condition is For parts or not working. Dispatched with eBay delivery – Shutl 2-3 days. Microsoft Xbox One Stereo Headset Microsoft Xbox One Chat Headset. No Accessories With Device. Sold As Seen. Bulk pallet for sale of Official Microsoft Xbox One Stereo Headsets. Just the headset no other accessories included. The headset is faulty! It is dead and is note detected when plugged in. Boom microphone can fold up and out of your way when not in use. Unidirectional microphone for clear voice capture. Sign in to Xbox Live to receive the latest console updates.